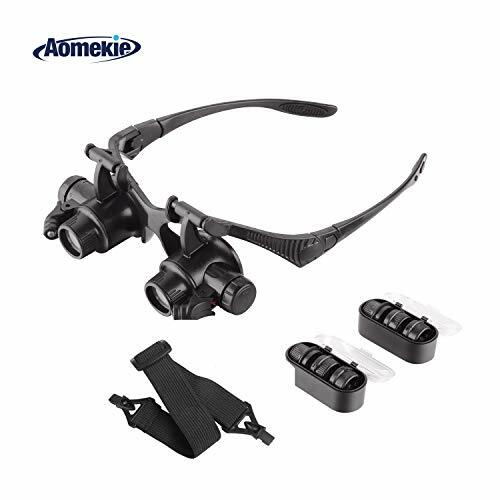 2 left/right magnifying eye patches with LED on the lens bracket. You may use two lens barrel alternately to eliminate visual fatigue and improve work effectively. Eye patches can be moved 5mm leftwards and 5mm rightwards. Face width and distance between left/right eyeballs can be adjusted to adapt to the central position of eye patches between both eyes. Eye patches can be rotated 180 degrees upwards and downwards on the bracket. It's not required to to take down the whole lens bracket when the magnifier is not used temporarily and you can reuse it conveniently. This product comes with extra interchangeable headband which can effectively solve such as falling-off problem. Angle of the LED light is adjustable. Note: Short Focal Distance from lens to product is 0.2-2 inch (0.5-5cm), just like the principle of microscope. Can not use your right and left eyes to watch at the same time, just only one eye. View More In Magnifying Tools. If you have any questions about this product by AOMEKIE, contact us by completing and submitting the form below. If you are looking for a specif part number, please include it with your message.